Don Andrés, you will be missed. After 21 years, Andrés Iniesta is no longer a Barça player. The man who made his first team debut with Barça as an 18 year old teenager departs the club as a 34 year old legend who won every trophy possible while being a key part of great teams for both club and country. We witnessed 16 marvelous seasons of Iniesta becoming a legend on and off the pitch. Iniesta is an icon who will be missed. During his time with the club, Iniesta won 35 major trophies. He played a key part in what is considerably the greatest Blaugrana and football side in history. During his time with the club, Barça won four UEFA Champions Leagues, nine La Liga titles, seven Copa del Reys, three FIFA Club World Cups while helping Spain win their first ever World Cup and two European Championships . He and Messi share the record of winning 32 major trophies as Blaugrana players and I and many fans wish he could stick around longer and add more to his tally. 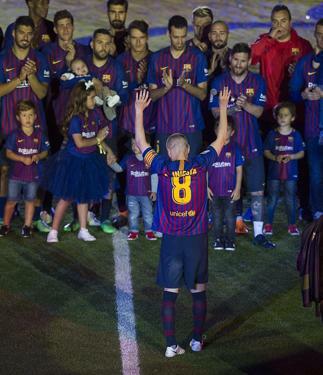 Iniesta is one of those heartwarming stories of a kid who rose through the ranks at La Masia and became a legend. I wish Iniesta was staying so he could take future Barça B players, such as Carles Aleñá, under his wings. Iniesta knows a thing or two about making the jump to the B team and how to be patient when minutes are scarce. After all, even though Iniesta made his first debut when he was 18, he had to wait until he was in his mid-20s before he became a trusty member of the first team. Those future Barça B players making the jump would have benefitted from having someone like Iniesta to act as their guru. Furthermore, Iniesta’s departure deprives the club of a mentor for newly signed midfielders. Coutinho recently said that when he signed for Barça, Iniesta was one of the first players to contact him and welcome him to the club. Coutinho also said “It was special to receive it and it gave me a lot of confidence.” Moreover, he could have helped new signings, midfielders, adapt to the style of the club. Finally, we will miss Iniesta because he was the link to the past of great performances and results as the club rose from underachievers to becoming the best in the world. His performance as a substitute in Paris in UEFA Champions League Final against Arsenal was his introduction to the world while we Cules already knew what this young phenom was capable of. We will always have that “Iniestazo” goal against Chelsea in the 2008-2009 Champions League Semi-Finals, those Clasico performances and goals, and thankfully, that superb goal against Sevilla in his last Copa del Rey Final, to ride off into the sunset. Players like Iniesta are a rare gem and we have been fortunate and blessed to watch him represent our club so admirably on and off the pitch. Without a doubt, he is a unique player like Iniesta is truly irreplaceable. He will now take his services to Japan and those are fans in store for a treat. Previous PostIniesta bids farewell as Barça end the season with a 1-0 victory over Real Sociedad. Next PostFC Barcelona defeat Tottenham on penalties to kick off their preseason.